Author contributions: Sperti C and Moletta L conceived the article and drafted the manuscript; Patanè G carried out literature review and preparation of the manuscript; all authors read and approved the final manuscript. Pancreatic metastases from other primary malignancies are a rare entity. By far, the most common primary cancer site resulting in an isolated pancreatic metastasis is the kidney, followed by colorectal cancer, melanoma, breast cancer, lung carcinoma and sarcoma. Only few data on the surgical outcome of pancreatic resections performed for metastases from other primary tumor have been published, and there are no guidelines to address the surgical treatment for these patients. In this study, we performed a review of the published literature, focusing on the early and long-term results of surgery for the most frequent primary tumors metastasizing to the pancreas. Results for the Literature’s analysis show that in last years an increasing number of surgical resections have been performed in selected patients with limited pancreatic disease. Pancreatic resection for metastatic disease can be performed with acceptable mortality and morbidity rates. The usefulness of pancreatic resection is mainly linked to the biology of the primary tumor metastasizing to the pancreas. The benefit of metastasectomy in terms of patient survival has been observed for metastases from renal cell cancer, while for other primary tumors, such as lung and breast cancers, the role of surgery is mainly palliative. Core tip: Pancreatic metastases represent a rare but increasing entity among pancreatic tumors. We have reviewed the literature’s reports of the more common metastatic tumors to the pancreas, evaluating early and long-term results of surgery. Pancreatic resection may appear a safe and feasible option also in metastatic tumors, but long term survival is achieved substantially only in renal cell cancer. In other metastatic tumors, pancreatectomy may offer a good palliation in selected patients, but it is to remark that surgery is only one option in the multimodality treatment of metastatic disease to the pancreas. Pancreatic metastases from other primary cancers are rare. Approximately 2% of pancreatic cancers are metastatic from other primary site[2,3]. In different autopsy series, a wide range of malignant tumors have been found to metastasize to the pancreas and the most frequent primary locations of tumor were the kidney, breast, colon, skin and lung[4-6]. It may be difficult to differentiate a pancreatic metastasis from a primary pancreatic tumor, being the clinical presentation and the radiological characteristics similar for both primary and secondary neoplasms[7,8]. Pancreatic metastases are asymptomatic in more than 50% of cases: they are often detected during follow-up investigations after surgery for a primary lesion or as an incidental finding on imaging studies performed for an unrelated condition[9,10]. At CT scan, pancreatic metastases may appear as hypervascular lesions, like in renal cell cancer (RCC) metastases (Figure 1A) or, as in the case of colon and melanoma metastases, as hypodense masses (Figure 1B). Positron emission tomography may be helpful in order to exclude other metachronous lesions than the pancreatic one or other primary synchronous tumors (Figure 2). Figure 1 Computed tomography scan of the abdomen. A: Computed tomography (CT) scan of the abdomen showing a contrast-enhanced pancreatic metastasis from a renal cell carcinoma; B: CT scan of the abdomen showing an hypodense metastatic lesion of the pancreatic head from a colon carcinoma. 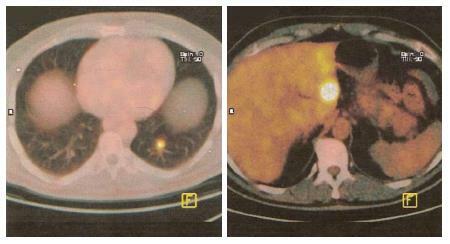 Figure 2 Positron emission tomography/computed tomography imaging showing a pathologic uptake of the tracer in the region of the pancreatic neck and in the left lung from a melanoma. Pancreatic metastases occur in two different clinicopathological settings, either as one manifestation in widespread disease or as an isolated mass of the pancreas. However, only few patients present with a single potentially resectable pancreatic lesion and the most common presentation is that of a widespread metastatic disease. The number of pancreatic resections for metastatic lesions in high volume centers has gradually increased, probably because of the greater knowledge of these clinical entities and the greater availability of radiological studies in asymptomatic patients. In recent years, different studies showed an improved survival in patients undergoing lung or liver resection for metastatic lesions from colorectal cancer[14,15]. Pancreatic resections were for many years associated with high rates of morbidity and mortality, but recent data have clearly shown that pancreatic surgery is safe and feasible in high-volume clinical centers: the lower morbidity and mortality rates make pancreatic resection an acceptable indication also in case of metastatic lesions[16-18]. In this study, we have reviewed the literature’s reports of the more common metastatic tumors to the pancreas, evaluating early and long-term results of surgery. The published Literature was systematically searched using PubMed and free text search engines up to October 2013. Search terms included: pancreatic neoplasms/secondary, pancreatectomy, renal cell cancer, breast cancer, melanoma, colorectal cancer, sarcoma, lung cell cancer. The “related articles” function was used to broaden the search and all abstracts, studies, and citations retrieved were reviewed. Only articles published in the English language, with abstracts, and human studies only were selected. Case reports were included for the less common neoplasms. In the case of sequential publications, the report with the most comprehensive information regarding the study population was selected. Studies were excluded from the analysis if: (1) the outcome and parameters of interest were not clearly reported, and (2) it was impossible to extract the data from the published results. Two investigators (LM and GP) reviewed the titles and abstracts and assessed the full text of the articles obtained to establish eligibility. The following data were extracted from each study: first Author, year of publication, number of patients, perioperative morbidity and mortality, and long-term outcome. For statistical analysis, overall averages are presented as weighted means (range) unless otherwise stated. The preliminary literature search showed 1536 studies matching the initial search criteria. After screening, 108 studies evaluating metastases to the pancreas were selected. There were 41 case series (more than two patients) and 67 single case reports, for a total of 418 patients with secondary tumor of the pancreas: metastases were mainly from RCC (n = 293), followed by melanoma (n = 38), colorectal cancer (n = 37), breast cancer (n = 19), sarcoma (n = 18), and lung cancer (n = 13). The results of the Literature’s review are showed for each tumor considered. By far, the most common primary cancer site resulting in an isolated pancreatic metastasis is the kidney. RCC accounts for approximately 2% of all adult malignancies. Among kidney-limited diseases, RCC has a high overall survival rate (up to 95%). However 20% to 30% of patients have metastases at presentation, and the 5-year survival rate is less than 10% once metastases spread. In autopsy series in primary RCC, pancreatic metastases were noted in 1.3% to 1.9%. Hirota et al revealed that a characteristic of the patients in this group was the long disease-free interval from the time of the nephrectomy to the diagnosis of metastatic disease. This long disease free interval indicates a biological pattern of slow growth, favouring local surgical resection. Pancreatic metastases are often the only metastatic lesions and they seems related to a good prognosis[17,23]. Pancreatic metastases are only rarely symptomatic; therefore a long follow-up (> 10 years) is indicated in patients with RCC. At CT scans metastases from RCC appear as hypervascular lesions, and a differential diagnosis must be done with primary endocrine tumors. OctreoScan® scintigraphy is not always able to differentiate neuroendocrine lesions from pancreatic metastases from RCC. A recent study on metastatic RCC showed the presence of positive scintigraphy, and thus the presence of somatostatin receptors, in 9 of 11 cases. A percutaneous fine-needle biopsy to confirm the clinical suspicion is seldom necessary. Pancreatic metastases from RCC can occur a long time after the diagnosis of the primary RCC. The presence of synchronous pancreatic lesions is less frequent (15%-27% of cases)[22,26,27] and it may be an expression of a widespread disease, thus limiting the benefit of a pancreatic metastasectomy. In a recent review by Masetti et al, univariate analysis showed that a disease-free survival time less than 2 years in metachronous metastases was associated with a worse survival. The detection of multiple pancreatic metastases occurs more often in RCC than in other primary malignancies and this must be taken into account in the planning of the surgical treatment of these patients. In a review of the literature we found 29 studies reporting on pancreatic resection for metastatic RCC (Table 1, [3,9,10,12,16,23,24,28-49]). Only reports with detailed clinical and follow-up informations on 2 or more patients were selected, while single case-reports were excluded. Informations on 293 patients have been published. Among these, the median interval between nephrectomy and pancreatic recurrence was 104 mo (range 0-348 mo). Perioperative mortality occurred in only 4 patients with a mortality rate of 1.5%. Morbidity was difficult to assess because this information wasn’t always reported and because in many reports it wasn’t possible to differentiate morbidity rate after resection for RCC from other primary tumors. Among the available data, the overall morbidity rate was 13.3%. Median follow-up was 36.8 mo (range 3-130 mo). Eighty patients died and among them 56 patients died of recurrent disease (in some reports this information was not available). Tanis et al, in a recent review of 421 patients undergoing resection of pancreatic RCC metastases, reported an actuarial 5 years survival rate, calculated on 321 patients for which data were available, of 72.6% and the survival of these patients was compared to that of 73 non-surgically treated patients: 2 and 5 years overall survival rates were 80% and 72% in the operated group and 41% and 14% in the non-operated group. Bassi et al reported in a single-centre series a great 5-year survival benefit after surgical resection compared with conservative treatment of unresectable disease (53% vs 26%). Pancreatic metastases from RCC are reported to have a better prognosis when compared to other primary tumors, therefore an aggressive treatment, i.e., surgical resection, should be considered in these patients. Reddy et al demonstrated that the median survival for pancreatic metastases from RCC was 4.8 years vs 0.9 years for metastases from melanoma. Konstantinidis et al reported a 5-year actuarial survival of 61%, and they demonstrated that RCC patients had a better median survival (8.7 years) compared to other pathologies. Chemotherapy, immunotherapy, and radiotherapy have generally proved to be ineffective for primary RCC or metastatic disease. Despite promising results with immunotherapy using IL-2, a complete response occurred in less than 15% and was rarely durable[50,51]. In more recent years several angiogenetic agents (bevacizumab, sunitinib, sorafenib) have showed promising results. Therefore a multidisciplinary approach has to be recommended in the treatment of pancreatic metastates from RCC and further studies are needed to establish the way to combine surgery with medical treatment in the different periods of the disease. Table 1 Pancreatic resections for metastates from renal cell carcinoma. NA: Not available; PD: Pancreaticoduodenectomy; PPPD: Pylorus-preserving pancreaticoduodenectony; DP: Distal pancreatectomy; CP: Central pancreatectomy; TP: Total pancreatectomy; PP: Partial pancreatectomy. In the English Literature only few studies on pancreatic resection for metastatic colorectal cancers have been published so far, representing only single case reports, rarely more than two patients. In recent years, several studies demonstrated encouraging results on surgical resections for metastatic colorectal cancer to the liver and lung; on the other hand, only few data are available for pancreatectomies in metastatic colorectal cancer. In a review of the literature, we selected 24 studies regarding surgical treatment of pancreatic metastases from colorectal cancer (Table 2[9,24,26,29,37,54-72]). Informations on 37 patients were available, 24 with a primary neoplasm of the colon and 11 with a primary rectal cancer. Among these patients, 28 presented with a single pancreatic metastasis and in 9 cases an associated surgical procedure was required for metastatic disease in other sites. There was no perioperative mortality. After pancreatic resection, a recurrence of disease occurred in 19 patients, with a median survival time of 21 mo (range 5-105 mo). Sixteen patients are alive with a median survival time of 12 mo (range 1.5-43 mo), while 5 patients are alive with recurrent disease (6 to 43 mo). It is interesting to note that all patients experienced a relief of symptoms (abdominal pain and obstructive jaundice) after surgical resection of metastases and they remained asymptomatic until recurrence of the disease. It is impossible to establish whether the same results can be achieved in these patients with a more conservative treatment, such as chemotherapy, because of the lack of information regarding the outcome of patients undergoing pancreatic resection and patients undergoing only chemotherapy. Considering the data available in the literature, it seems reasonable to consider surgery for pancreatic metastases from colorectal cancer a palliative treatment. However, it has to be remark that a multidisciplinary approach has to be recommended in the treatment of pancreatic metastates from colorectal cancer, and an aggressive surgical approach may be considered in selected cases, in particular in symptomatic patients with isolated pancreatic metastasis. Table 2 Pancreatic resections for metastatic colorectal cancer. NR: Not reported; DP: Distal pancreatectomy; PD: Pancreaticoduodenectomy; PPPD: Pylorus-preserving pancreaticoduodenectomy; MSPP: Middle-segment-preserving pancreatectomy; SMV: Superior mesenteric vein; AWD: Alive with disease. Metastases from malignant melanoma can be located in the gastrointestinal tract (50%-60% of cases of malignant melanoma in autopsy series), although the clinical diagnosis occur in only 1.5% to 4.4% of patients. A few cases of long-term survival after radical surgical resection of melanoma metastases in the gastrointestinal tract have been reported[74,75], but the role of surgery in the treatment of pancreatic metastases from melanoma is unknown, due to the lack of data regarding these clinical entities[9,76]. When compared to other primary tumors metastasizing to the pancreas, melanoma seems related to a poor prognosis. In a literature review, we collected a total of 23 reports (19 single-patient reports, 1 with two patients, 3 with more than 2 patients) on surgical treatment of pancreatic metastases from melanoma (Table 3[24,37,58,74,77-95]). Among these patients, 12 had a primary skin melanoma, 6 had an ocular melanoma, 1 had a melanoma of the nasal cavity and in 19 cases the primary site of melanoma was unknown. No perioperative mortality was reported. Twenty patients died of recurrent disease: the median survival time of these patients was 10 mo (range 3-25 mo). Thirteen patients are alive at 6 to 108 mo (median 16 mo); 2 patients were alive, with recurrence, at 8 and 12 mo respectively. Although malignant melanoma is associated with a poor prognosis and the role of surgery seems limited to palliation, some cases of a prolonged survival after surgical removal of melanoma metastases have been reported and, when possible, surgical resection seems to be the most effective therapeutic option available today[96,97]. However, there are no sufficient data in the literature to compare patients treated with only conservative management (chemotherapy) with surgical resected patients. Therefore surgical resection for pancreatic metastases from melanoma should be considered a palliative treatment, to be taken in account in pancreatic isolated lesions as a part of the multimodality treatment of this clinical entity. Table 3 Pancreatic resections for metastatic melanoma. 15 years survival rate. NR: Not reported; NA: Not available; DP: Distal pancreatectomy; PD: Pancreaticoduodenectomy; PPPD: Pylorus-preserving pancreaticoduodenectomy; MSPP: Middle-segment-preserving pancreatectomy; SMV: Superior mesenteric vein; DOD: Dead of disease; ANED: Alive not evidence of disease; AWD: Alive with disease. Pancreatic metastases from breast cancer are rare, with a reported rate of 13% in an autopsy series. Metastatic breast cancer is usually a widespread disease, with isolated pancreatic lesions being an occasional event. In a literature review, we selected 16 studies regarding patients undergoing surgery for pancreatic metastases from breast cancer (Table 4[9,24,26,40,57,99-110]). Breast cancer that metastasize to the pancreas may have a long latency period between the primary tumor diagnosis and the metastasis occurrence (median 39.5 mo, range 0-216). Solitary pancreatic metastasis was present in 17 patients, and 1 underwent also a subtotal gastrectomy for extrapancreatic involvement. There was no perioperative mortality. Five patients died of recurrent disease: the survival time was available in only three of these patients and the median was 26 mo (range 7-36 mo). Fourteen patients are alive at 5 to 80 mo (median 19), although 5 patients had a short follow-up (up to 12 mo) and in one patients follow-up time is not reported; 3 patients were alive, with recurrence, at 11 to 48 mo. All patients experienced a relief of symptoms (abdominal pain and obstructive jaundice) after surgical resection of metastases and they remained asymptomatic until recurrence of the disease. Masetti et al analysing the prognostic factors in metastatic tumors to the pancreas, found at univariate survival analysis a 2-years probability of survival of 57.1% in pancreas metastases from breast cancer and a 5-years probability of survival of 34.3%. Even in the case of pancreatic metastases from breast cancer it is impossible to establish the course of the disease without surgical resection and to assess the real benefit in survival after metastasectomy. However, in selected patients with limited pancreatic disease, surgical resection could have a palliative role in association with chemotherapy, hormonal therapy and radiation therapy in the multimodality treatment of metastatic breast carcinoma. Table 4 Pancreatic resections for metastatic breast cancer. NR: Not reported; DP: Distal pancreatectomy; NA: Not available; PD: Pancreaticoduodenectomy; PPPD: Pylorus-preserving pancreaticoduodenectomy; TP: Total pancreatectomy; AWD: Alive with disease. Lung cancer metastasize to many site, but most frequently to bone, liver and adrenal glands[111,112]. Isolated pancreatic metastases from lung cancer are extremely rare and they are usually metachronous lesions, identified at follow-up investigation. The few reports available in the literature show that small cell lung cancer (SCLC) represents the most typical histological subtype metastasizing to the pancreas. The usefulness of surgical resection for pancreatic metastasis from lung cancer is difﬁcult to assess because of the rarity of this type of lesion. Additionally, most cases of pancreatic metastasis from lung cancer are unresectable at the time of diagnosis because the disease is already widespread. Z’graggen et al and Moussa et al reported four patients each with secondary metastasis from lung cancer (including small cell lung cancer): there were no resectable cases mainly due to local invasion and metastases to other organs. Hiotis et al reported three cases of pancreatic resections for metastatic lung cancer, with a poor long-term survival after surgery. In a recent review of the literature, Reddy et al reported pancreatic resections from lung cancer as having the worst outcome when compared to other primary tumors type metastatic to the pancreas. In a literature review, we selected 12 studies reporting surgical resection for pancreatic involvement from lung cancer (Table 5[24,26,57,68,82,83,102,114-118]). Among these patients, in 10 cases the primary lung cancer was a NSCLC, 1 case was a SCLC and in the last patient the primary lung cancer is not specified. One patient died after surgical resection. Five patients died of recurrent disease, with a median survival time of 7 mo (range 3-14 mo). Six patients are alive with a median survival time of 19 mo (range 6-24 mo). In all cases, preoperative symptoms (obstructive jaundice and abdominal pain) disappeared after surgery. Pancreatic metastases from lung cancer have a poor prognosis and treatment options for metastatic lung cancer lesions to the pancreas are mainly palliative. Table 5 Pancreatic resections for metastatic lung cancer. NSCLC: Non-small cell lung cancer; SCLC: Small cell lung cancer; NA: Not available; DP: Distal pancreatectomy; PD: Pancreaticoduodenectomy; PPPD: Pylorus-preserving pancreaticoduodenectomy; DOD: Dead of disease. Metastatic sarcoma has generally a poor survival, and radical surgical represent the only therapeutical chance for these patients. Isolated pancreatic involvement by sarcomas is rarely encountered: in a recent experience Yoon et al reported only 2 cases (4%) of sarcomas among 53 patients with pancreatic metastases collected at their Institution. So, the outcomes for patients with metastatic sarcoma who did or did not pancreatic resection are unknown. In their review, Reddy et al collected only 10 patients with isolated pancreatic metastasis with a median survival of 40 mo and 5-year survival of 14%. Even if pancreatic metastases from sarcoma seem related with a modest survival, the few data available does not allow to draw any definitive conclusion. Recently, Robert et al reported a case of leiomyosarcoma metastatic to the pancreas and collected 17 of the such cases published in the Literature. Clinical details were available in only 8 reports, and 7 patients underwent pancreatic resection: 5 patients were alive (one with disease) and 2 died, with a median survival time of 23 mo. As for other cancers, resection of pancreatic metastases from sarcoma is substantially justified in individual basis. In recent years, an increased number of surgical resections for pancreatic metastases has been performed in high-volume centers. It seems reasonable that resection is indicated for an isolated and resectable metastasis in a patient fit to tolerate pancreatectomy, evaluating each single case on an individual basis and with a multidisciplinary approach. The type of surgical procedure is another controversial aspect in pancreatic metastases. Standardized pancreatic resection adapted to the location of the tumor, in terms of partial pancreaticoduodencectomy, distal pancreatectomy, and total pancreatectomy, is generally recommended for the management of isolated pancreatic metastases. Bassi et al observed a high rate of pancreatic recurrences after atypical resections and recommended standard radical resection. Considering the high frequency of multiple metastases, a recurrence after surgical resection could be related to multifocality of the tumor rather than to an atypical surgical procedure. Since pancreatic metastases is often multifocal, partial pancreatectomies require thorough exploration of the pancreatic remnant by palpation and ultrasound. Intraoperative ultrasound is a very useful device: it guides the surgeon in choosing the most appropriate surgical procedure by defining the presence of multiple pancreatic lesions and the proximity of the metastasis to the Wirsung duct. Surgical strategy should be tailored on each single case, in order to achieve an R0 resection and ensuring the absence of further disease in the pancreatic parenchyma. Surgical resection may be considered also in selected cases of extrapancreatic disease, if technically feasible. The effectiveness of resection for pancreatic metastases is mainly dependent on the tumor biology of the primary cancer. The benefit of metastasectomy in terms of patient survival has been observed for metastases from RCC, while for other primary tumors the role of surgery is mainly palliative. Patients with pancreatic metastases from RCC represent a favourable subgroup and surgical resection is recommended for these patients, whenever possible. However, a multidisciplinary approach has to be recommended and further studies are needed to establish the way to combine surgery with medical treatment in the different periods of the disease. Considering the data available in the literature, it seems reasonable to consider surgery for pancreatic metastases from colorectal cancer a palliative treatment. However, an aggressive surgical approach may be considered in selected cases, in particular in symptomatic patients with isolated pancreatic metastasis. Resection of melanoma metastatic to the pancreas appears to be only a palliative procedure. However, surgical resection may be considered in limited pancreatic disease with palliative intent. Even in the case of pancreatic metastases from breast cancer it is impossible to establish the course of the disease without surgical resection and to assess the real benefit in survival of the metastasectomy. However, in selected patients with a limited pancreatic disease, surgery may play a role in conjunction with chemotherapy, hormonal therapy and radiation therapy in the multimodality treatment of metastatic breast carcinoma. Solitary pancreatic metastases from lung cancer have a poor prognosis and treatment options for metastatic lung cancer lesions to the pancreas are mainly palliative. Finally, resection of pancreatic metastases from sarcoma is substantially justified in individual basis. Pancreatic metastases, although uncommon, are an increasing clinical entity. Surgical resection is often advocated when the lesion is single and for patients fit to perform a pancreatectomy. The usefulness of pancreatic resection is mainly linked to the biology of the primary tumor metastasizing to the pancreas. The benefit of metastasectomy in terms of patient survival has been observed for metastases from RCC, while for other tumors the role of surgery is mainly palliative. In fact, from our data and from a review of the literature, pancreatic surgery for metastases from colorectal cancer and melanoma may be considered for palliation, even if in selected cases surgical resection can be advocated in the multimodality treatment of metastatic colorectal cancer. Even in the case of pancreatic metastases from breast cancer, an aggressive surgical approach appears useful for good palliation in selected patients with a limited pancreatic disease. Patients with solitary metastases from lung cancer have a poor outcome and do not benefit from surgical resection. Finally, resection of pancreatic metastases from sarcoma is substantially justified only in very selected patients. Patients with pancreatic metastases should be evaluated with a multidisciplinary approach, being surgery part of the multimodality treatment of these clinical entities. Further studies are needed to establish the way to combine surgery with medical treatments in the different metastatic diseases to the pancreas.